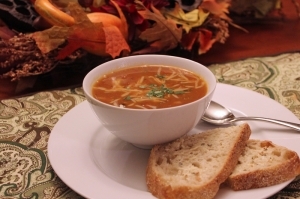 This hearty soup is full of protein and perfect for those cold, blustery days. It simmers all afternoon making your house smell wonderful. Pair it with a salad and you’ve got a perfect stick-to-your-ribs meal. This is my mom’s go-to bean soup. It is often what’s on the stove when I make the long drive to their home in Pennsylvania – a good choice when you’re not sure when folks are arriving for dinner! It has enough substance to satisfy the guys in my family who don’t consider soup a meal. Add all of the ingredients through the ham in a soup pot. Add the herb bundle. The soup simmers for five hours, but mid-way through, add in the raw chicken breast. It’ll cook in the wonderful broth. Before serving, remove the herb bag and the chicken breast. With a fork and knife, shred the chicken and return it to the pot along with the cheddar cheese. Stir until the cheese has melted. Serve with a salad and crusty French bread. Soak the beans in a pot of water overnight. If it’s too late for the overnight method, use the quick-soak approach. Boil the beans in water for 3 minutes in a heavy pot, cover and set aside for two hours. Drain the beans and proceed with the recipe. You can use leftover chicken, dice it and add it to the soup towards the end of the cooking process. If you don’t have leftover ham, purchase a thick slice of high quality deli ham and dice. I used Hannaford’s Taste of Inspirations Black Forest Ham for my latest pot of soup. If you worry about serving the men in your house beans, mom swears that adding a couple of tablespoons of vinegar to the soup towards the end helps to counter potentially gaseous bean effect.